How Many Michellin Stars in Vegas? Does Michellin review Vegas? If so, in the latest publication, which restaurants received stars and how many?? If you're in the SW&Western States forum, type in "Michelin" in the search box at the bottom left and you'll find what you're looking for. I was fortunate enough to be invited to the reception at The Wynn on October 22 when the Michelin stars for Las Vegas were announced. 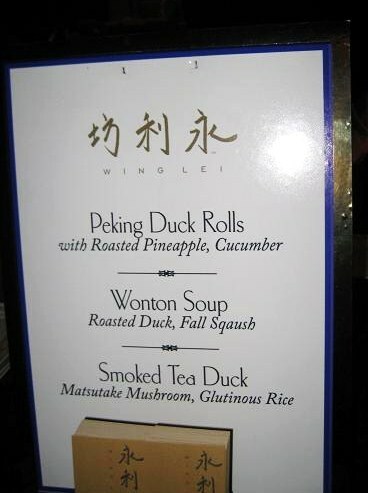 The not-so-secret announcements of which Las Vegas restaurants garnered stars in the 2009 Michelin Guide were “formally” announced at a private reception at The Wynn on October 22. (The “informal” announcements of who won a star in Las Vegas were leaked to the press nearly two weeks before the event). I don’t particularly care who wins Michelin stars or why, (I happen to put more faith in my personal taste tests rather than solely relying on the opinions of Michelin in determining whether or not a restaurant is worthy). But I felt lucky and blessed to be invited nonetheless because it afforded me the opportunity to be among some of the top chefs of the day-(Chefs with and without stars). 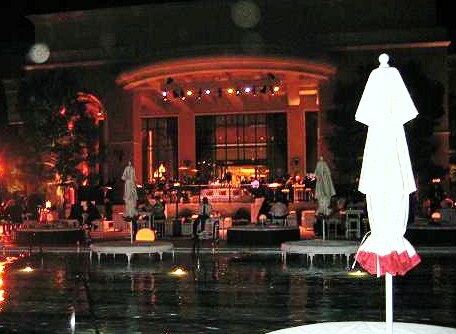 The party was held at The Wynn in a private, outdoor pool and garden setting. 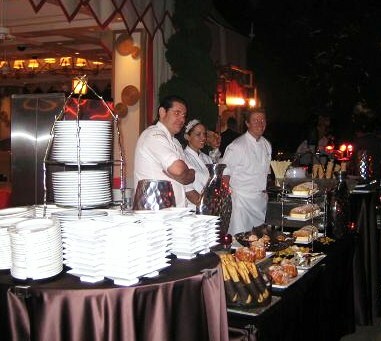 Surrounding the pool were food stations from the restaurants at The Wynn-each serving small bites of some of their signature dishes. 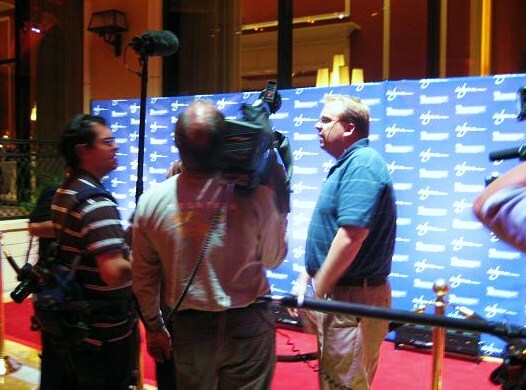 Michelin and Wynn set up a photo backdrop and red carpet so the “star-winning” Chefs could be interviewed and photographed as they entered the party. (Note that the backdrop has “Wynn” printed on it. 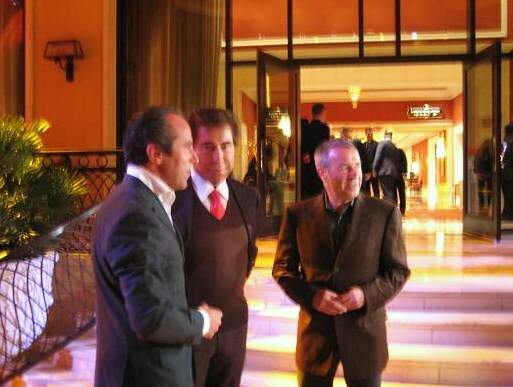 Steve Wynn never overlooks an opportunity to catch some press). I found it quite amusing when a Chef who isn’t employed by Mr. Wynn at his palace came forward to accept his star, only to be photographed in front of a backdrop with the competition’s name splattered all over it. Pure Las Vegas one upmanship indeed. Daniel Boulud, (we’ve lost track of how many stars he’s won), plating some of his impressive charcuterie. Boulud and crew displayed a table of charcuterie the likes of which had never been seen or tasted in Las Vegas. I’m quite sure all local pigs in Clark County-and their feet, tails, ears and innards-had been bought by Chef Boulud. Is there any Guy Savoy celebration again last August (i.e. its 2 year old restaurant)? I don't think there was any special celebration on the 2 year anniversary of Guy Savoy at Caesar's Palace. At least not like the one-year anniversary party/dinner I went to in May of 2007. Chef Savoy does come to Las Vegas but I'm not sure of his schedule. 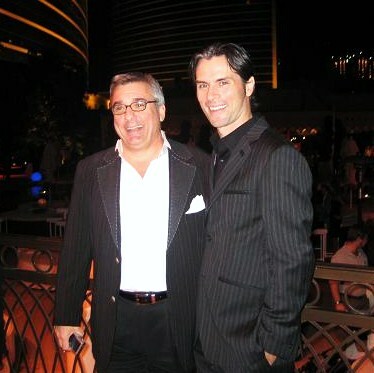 I did exchange greetings with Frank Savoy when I was in Las Vegas in October and the restaurant is doing well. He's especially proud of the "Bubbles and Bites" menu that they introduced this year in the small bar area at the front of the restaurant. Customers can taste some of the restaurants signature dishes with a glass of champagne without having to take the time to enjoy the full, formal experience of dining in the main restaurant. Savoy is quite worthy of the two star rating from Michelin. Can you explain what you mean by this? Wynn, the owner of many hotels and resorts, used to own specifically the Picasso restaurant in the Bellagio? Who own's the Bellagio? I assume it's the same person that owns all the restaurants inside the resort. And the restaurant itself, is worth BILLIONS? Steve Wynn originally was responsible for building Bellagio. Mr. Wynn then sold Bellagio (that's worth billions) to MGM/Mirage. Since then, he has opened Wynn Resort and about two to three weeks ago, Encore Resort, where I'll be staying in a couple of weeks and trying to dine at all five Encore restaurants. Ah, yes, that certainly helps. I was just at Encore for New Year's. I know you are dinign at all five, but their Cafe was super nice. The service was almost 1 star to me, even though it's just a cafe! What other Encore restaurant did you try besides Society? What did you order? Encore on NYE? Sounds like you were one of the few people eating their meals instead of drinking them, ehh? Steve Wynn pretty much knows restaurants, at least knows how to pick the good ones. I've eaten at most of the restaurants over at Wynn, and I would say that top to bottom, Wynn has a slight edge over Bellagio as the best overall group of restaurants in one casino/resort along the Strip. Thank you rj, you are of course right on with your response. The relationships in Las Vegas between the owners of the hotels-to the restaurants-to the restaurant staff-to the chef-can be quite complicated and difficult to follow. As rj mentioned, Steve Wynn developed and basically was the "owner" if you will of the Bellagio when it opened. He was responsible for bringing Chef Serrano to Picasso restaurant at Bellagio. When Mr. Wynn sold his stake in Bellagio to the MGM/Mirage corporation, Chef Serrano stayed on at Picasso. I get the sense that while they parted ways formally in terms of their business relationship at Bellagio-Mr. Wynn and Chef Serrano are still great friends. (As witnessed by my above photo post of Mr. Wynn, Chef Serrano and Jean-Luc Naret). I also have the sense that Mr. Wynn is quite proud of the fact that many of the Chefs that he has employed, both past and present, are the winners of Michelin stars. I've been trying like heck to figure out how much Alex or Daniel Boulud at the Wynn are likely to cost out the door. The online menus don't state the price. In another thread titled wynn resort, you can see my post on Alex back in Aug. 2007. The price for the full tasting menu back then was $195, not including wine pairings. That was a "bargain" compared to dining at Joel Robuchon (not L'Atelier) or Guy Savoy. And the quality was right up there. I think now, expect that tasting menu to start around $200-225. The menu from Daniel Boulud is available on the Wynn Resort website. I checked it tonight. Click to Dining, then to Daniel Boulud. At the bottom of the restaurant's description is the link to Download Menu. They're offering an early three-course dinner for $48. Afterwards, the entrees range between $30's-40's. I'll be heading over to Las Vegas this MLK/Inauguration weekend. I can double-check for you. Thanks Russell. After much perseveration, I decided to go with RM Seafood and L'atelier for our two dinners, mainly based on David Ross' judgments about overall value and other rave reviews. The upstairs fine dining element of RM Seafood is no more (thanks recession). No thanks to Open Table (assholes who didn't let me know), the upstairs closed on February 3. We ate downstairs and were not impressed. Although my fiance thought Chef R looked scary (he looks like he did in ICJ, only grayer and balder), he was very charming although they claimed he spoke next to no English. We spoke with him in broken French, broken Japanese, and broken English. An awesome night. The only meals I've had that was close were Chez Panisse circa 1987 and minibar. 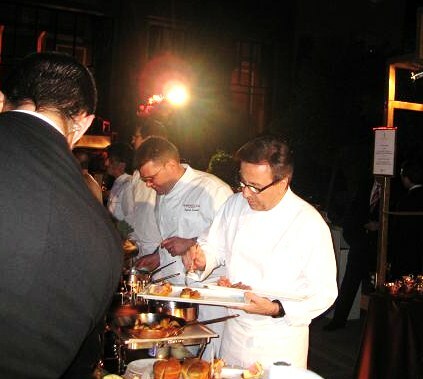 Actually, Chef Rick Moonen closed his upstairs restaurant, as an opportunity to "reinventing the dining experience." Click here for docsconz's post. L'atelier was great. Chef Robuchon was there and schmoozing, even with the people of the L'atelier side. The meal was great. We had the Decouverte. Our server told me that, given the economy, Chef Moonen decided to close the upstairs. I don't know what is correct. Yes. Chef Robuchon was there. We engaged him in conversation and he gave me his card. I considered asking him for a pic of him and me but I thought it would make me look like a total idiot. The hostess made a point that he was there and, by gosh, he was. He looks like he did in the real Iron Chef...except grayer and older. The Executive Chef, Steve Benjamin, also came around talking to us...that was cool. BTW, I complained about the fact that OpenTable didn't let me know that the upstairs at RM was closed; they apologized and gave me 1000 points. I spoke to Chef Moonen directly and specifically asked him about this. He was quite upbeat explaining that they were re-working the upstairs restaurant and expected to reopen this summer. 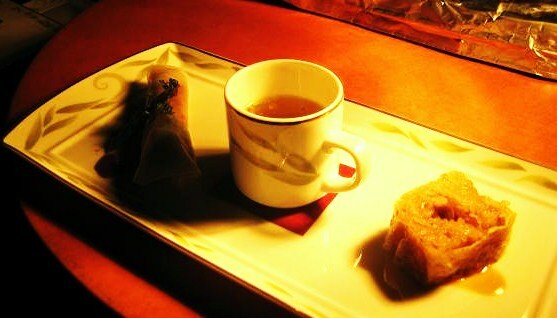 He says that he is aiming for Michelin stars.